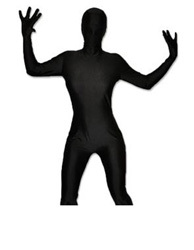 Morph Suits are the latest fashion. 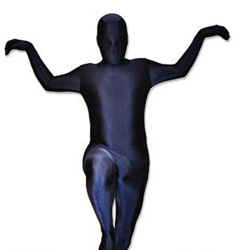 If you like fancy dress, going to parties or are just plain ugly, then the Morph Suit is perfect. 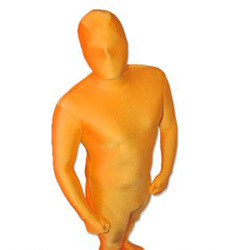 The Morph Suit might show all the lumps and bumps but who cares, bar any 'unique' lumps you probably won't be recognised and you'll be having too much fun to care. 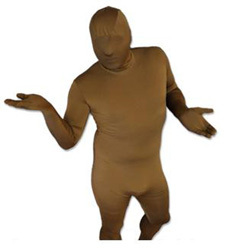 Morph Suits cover the whole of your body. : hands, face and feet. 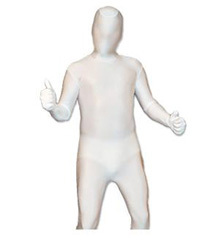 and ourmorph suits are specially designed with a double zip which finishes right at the top of your head for easy access in and out of the suit. So if you are heading to a party on your own, you can zip-up yourself up for maximum impact on arrival. And later, if you want the girl you’ve been dancing with for the past 20 minutes to see you, then it’s easy just to unzip, pull the hood down and engage. Perfect….assuming you are mildly attractive. 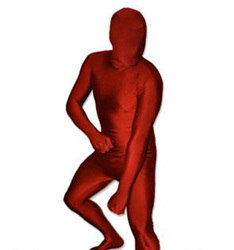 Stretchy Spandex MORPH Suit with Zip up back - Costume covers the WHOLE of the Body! 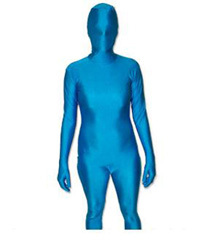 Stretchy Spandex MORPH Suit with Zip up back - Costume covers the WHOLE of the Body! Can you re-use them? 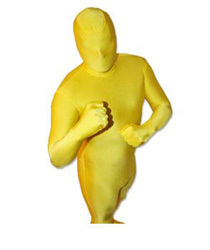 Morphsuits are pretty hard wearing and what’s best is, that unlike most other fancy dress, there aren’t lots of different pieces to lose, so you should get plenty of wear out of your Morphsuit. If you do happen to spill something on it just chuck it in the washing machine. Do you have to be a gym buff to wear one? Absolutely not! 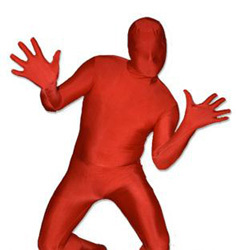 Morphsuits are just about fun, not about looking good. 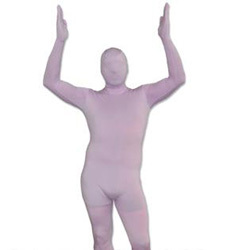 Boys or girls, tall, short or even if there is a little more of you to love we have a Morphsuit for you! Plus with the hood, if you do feel like keeping your identity a mystery �C like a super-hero �C then there is no need to reveal yourself! Can you unzip the suit yourself? 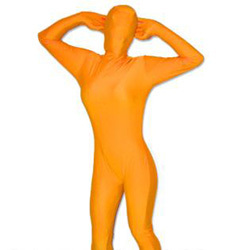 Morph suit cover the whole of your body. And we really mean whole: hands, face and feet. However, our suits are specially designed with a double zip which finishes right at the top of your head for easy access in and out of the suit. So if you are heading to a party on your own, you can zip-up yourself up for maximum impact on arrival. And later, if you want the girl you’ve been dancing with for the past 20 minutes to see you, then it’s easy just to unzip, pull the hood down and engage. Perfect….assuming you are mildly attractive. Where’s best to keep your wallet? Morphmen travel light but money makes the world go round and a phone is useful if you lose all your mates while dressed in an all-in-1 lycra ensemble. We’ve seen loads of options for getting your valuables around, the most popular is having some cash in your shoe and your phone in a sock. Alternatively some morphs prefer a stylish bum-bag. How can you see out of them? 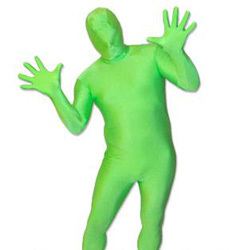 When we first designed Morph suits they were difficult to see where you were going, which was a bit problematic on the dance floor. Since then, we’ve redesigned the suit, so you can see out, but people can’t see in. You’ll be able to see out well enough to enjoy a stag weekend, ambassadors reception or leisurely stroll to pick up the papers. Some people (crazy fools) have even tried to play competitive sport in their Morph suits. 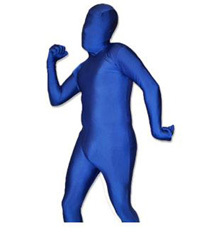 What do I wear under a morph suit? A pair of tight pants. Baggy boxers just make you look like you’ve got a lumpy rear end.